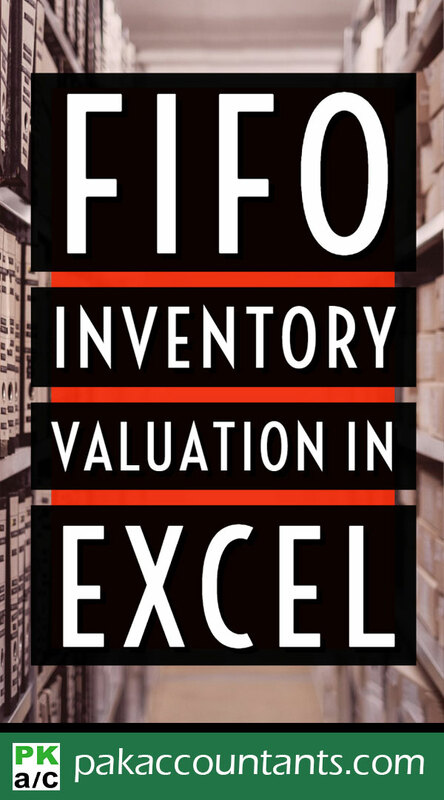 Inventory can be valued in number of ways, FIFO, LIFO and AVCO being the most famous. 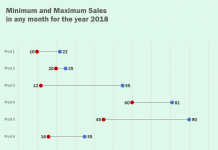 To learn few more inventory valuation methods have a quick look at this: What are different inventory valuation methods? First In First Out (FIFO) assumes that every time units are taken from store, they are issued from the oldest available lot first and next lot to be consumed only if needed. This requirement makes the calculations a little too complex for formulas. May be there is a way to do it via formulas but I am unaware of it yet and would love to know. On the other hand VBA is also an alien knowledge for me so far. So is there a way? Yes there is! This is where Excel Data Tables comes handy. One of the less known and used tool for sure. But it can make this process super smooth and easy. So lets get to learn it! Skip the tutorial for now and get the file. This fully unlocked no secrets held Excel file is available for you to change and use at your disposal. It is designed to input data easily. 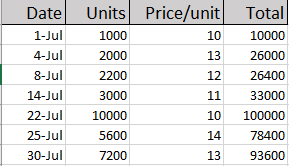 You just have to give the units sold and all calculations will be done automatically. Step 1: Download this workbook. It has the dummy data that we can use to understand the process. Step 3: Suppose we have made a sale of 1000 units. So enter that in cell G1 and name the cell as “sales” by typing in the name box having cell G1 active. Step 4: Now we want the total units sold to be divided as per lots available deducting from the first available lot. Go to cell F4 and put this formula and drag it down to cell F10. Step 10: Select the range L3: M10 and go to Data tab > Forecast group > Click what-if drop down button > click Data table. A pop up will appear. 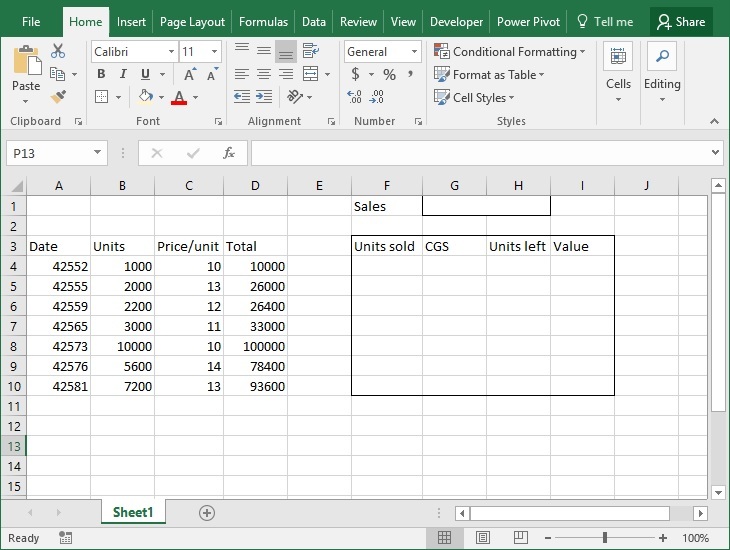 Leave the row input cell empty and mention units sold in column input cell G1. Click OK. Step 13: Hide the columns L and M. Now test your report by typing the units in “Units” column and it will give you the correct CGS as per FIFO. So here you have fully working FIFO Calculator and a mini report generator! 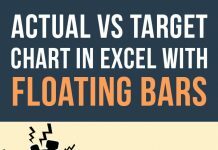 Download the fully working and unlocked Excel file that can serve as a template for your FIFO calculations and also help learning the techniques applied. I have made a FIFO share register using a data table as in your example. Somehow the COGS part in the end is not coming right. How can I mail you my excel sheet if you could guide me? tell me by which formula 1st semester cell record will show in 2nd semester cell record until he will pass the exam…………….same condition will apply next more 6 semesters e.g 3rd, 4th, 5th, 6th, 7th, 8th so on. I hope that you will give me answer. Awesome! and very easy to understand. 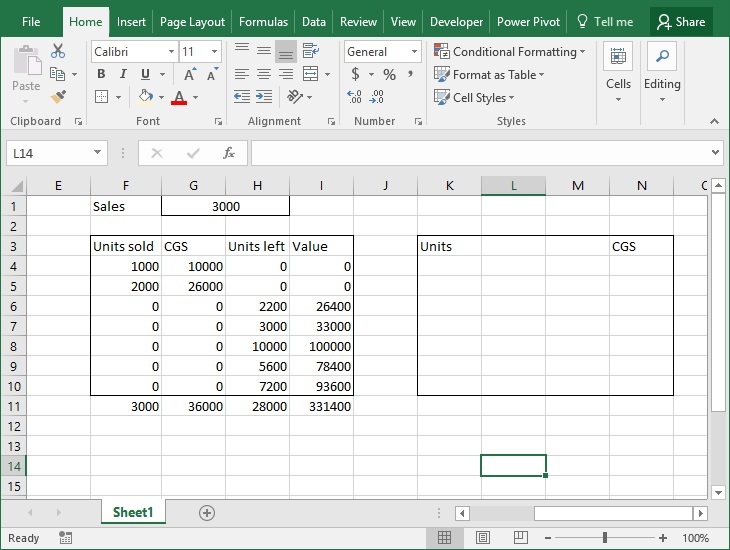 Could you make some changes to the formulas and have the sheet calculate using LIFO? A detailed tutorial is already in process and will be published today. Will update the comment with link. is it possible to tune these formulas to have the same template for weighted average? This first formula is wrong… could anyone help me please? This has been super helpful information, but i can’t get the formula’s to work in my google drive spreadsheet. For this to work we need data tables like functionality implemented. I will have to check if google spreadsheets allow this method to work or not as I am not using google sheets frequently.